White Dot was painted in 1923 while Kandinsky was a professor at the Bauhaus. He combined various shades of white which are thought to imply possibilities in life and bold curving shapes of black which portray the antithesis, death. Interspersed are varying shades of red, blue and yellow. The circle was the perfect shape to Kandinsky and he felt it was "the synthesis of the greatest oppositions". He believed it led to the 4th dimension and was seen throughout many of his works of art during this period. The black circle with the white dot draws the viewer's eye to the upper right of the canvas with an intensity that is broken by the "squiggled" black line that bisects the canvas on the diagonal. The triangles as well as other shapes appear throughout the piece broken by diagonal black lines. Not only do layered planes of color give this two-dimensional painting depth but tonal variations of color on a given shape lends a three dimensional feel as well. 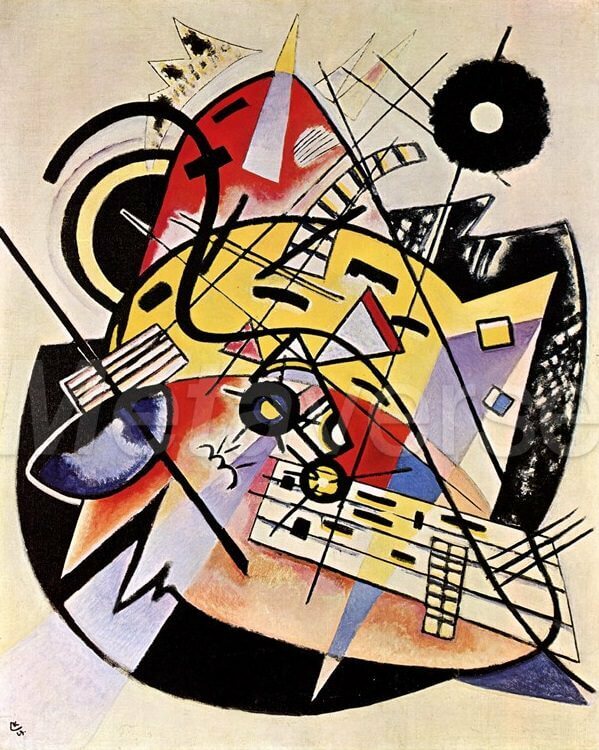 Kandinsky's connection to music is felt as the riot of colors and various shapes can be compared to the arrangement of musical notes. The combination of angles and curved lines as well as bold color and shaded forms imbue the painting with energy and one could expect to hear a symphony resonating off the canvas.